I have just re-read my post titled A beginning and I really don’t like how it sounds like a poor me pity party. I try to be honest, but I think I just come across as wanting sympathy. that is not true at all. I just want people to be aware that Fibro is real, mental health issues are real, and those of that suffer just want to be treated as normally as we can be. I don’t need or want pity, I need support. I adore the fact that my family has taken my illness in stride. 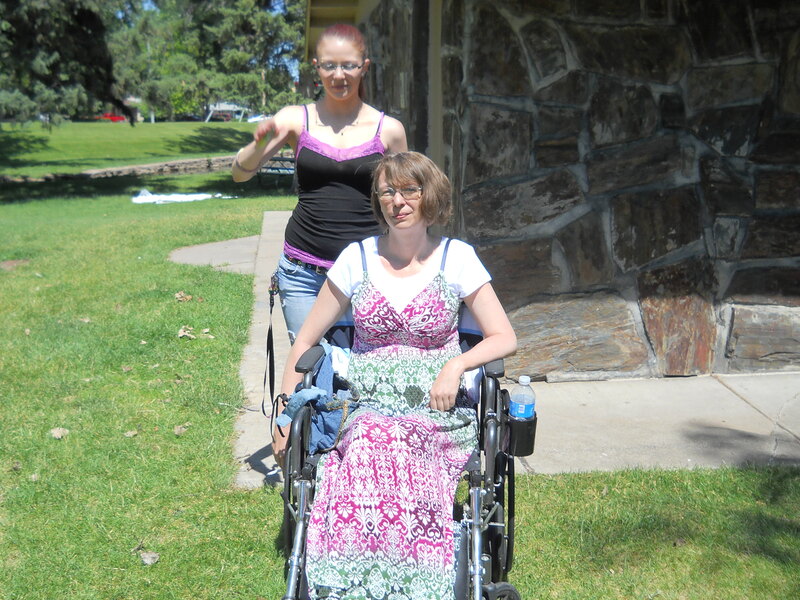 My kids, who I don’t see nearly as much as I’d like to due to distance, never bat an eye when I need my wheelchair. They simply step behind me and start pushing, sometimes making car noises while pusing me around the store. My husband didn’t bat an eye when he had to take over most of the cooking and cleaning on top of a full time job. My best friend, on the rare occasion I am in public, simply pushes me to a quiet corner, stands between me and the rest of the people and calmly talks to me when I am panicing. I would be lost without these people and their unwavering support. I also noticed in my first post that I failed to explain agorophobia. It simply is a social anxiety disorder…an extreme fear of other people, public places, that kind of thing. At one point, I was afraid to move around my own home and simply remained in the living room for about 6 weeks. There I go being Debbie Downer again. Dangnabit! I like that I am able to not only share my experience and interace with others in an environment that does not send me into a panic attack. I like that I am able to laugh at myself. I know that our country especially, but all over the world people are mourning the tragic events in Colorado. But rather than focus on the monster that perpetrated this horrific crime, I feel like we should raise up and praise not only the victims, but the survivors and emergency personnel involved. All to often, the hidden but extraordinary efforts of emergency responders are forgotten in the aftermath. I support the outpouring of love for the victims and survivors, but want to take a moment to say Thanks to the ambulance drivers, the paramedics, the police officers, and the nurses and doctors at the hospital caring for these folks. It is at times like these you really learn what is important, and I promise it is not the sexual orientation or skin color of your rescuer. It may not be much, but from the bottom of my heart, I want to say Thank You to all the emergency responders in America, but particularly in Aurora, Colorado. So, I have had this journal for a while now and have never posted anything. The main reason I signed up was to follow some of my favorite fan fiction writers when they moved from FFN. I can’t promise I will update very regularly, or often but when I can, and have something to say, I will. I thought maybe the best place to start was to tell you some about me, which I hate doing. I hate being the center of attention. I have always wanted to be invisible so no one would notice me. I assume (I know, I know not always a good idea) that comes from years and years of emotional and physical abuse growing up at the hands of my brother. Everytime I think I have got beyond that damage, I find I am not. As a married (21 years now) mother of 3 grown children, I hope I get past it soon. I have been diagnosed with PTSD, MDD, OCD, and Fibromyalgia. There are a couple of other physical diagnosis, but they are really not important to this discussion. Physically, I am very limited. I am right handed, however my right hand is hopelessly useless, and we don’t know why. The simple act of opening and closing my hand is excruciating, on the rare occasion I can do it at all. I have learned to use my left hand almost exclusively through trial and error. Some days I am confined to a wheelchair, other days I can get around with a rollator ( a walker with 4 wheels). When I can walk, it is very short distances, and for only a few minutes. Doing everyday things like grocery shopping requires a lot of planning ahead, and 2 people to assist me. I need one person to push my chair and another person to push the grocery cart. Usually my husband just goes without me after I write a list (with my left hand, Fun). As a side note, one of my helpers needs to drive as well as I cannot. I cannot pass the vision test for a driver’s license. After 6 months of PT and OT, I can Finally take care of most of my hygiene needs myself. I have a special chair to put in the shower, and a cuff that makes it much easier to grasp with my right hand things like my razor, or toothbrush. A full bottle of shampoo or body wash requires both hands to maneuver, but I have managed to find ways to make it work. Dressing myself is possible, but very difficult. Just as an experiment, try putting on undergarments, a dress shirt, pants, socks and shoes with only one hand. Things like hooking a bra, buttoning your shirt and pants, or tying your shoes are nearly impossible without a lot of training, trial and effort. I can manage everything but the buttons on a shirt right now. Typically I will wear a dress that has a built in bra and can just slip over my head, along with flip flops. I can put those on without assistance. At 41 years old, it really bothers me that I need help dressing. As far as my mental health goes, I cope the best I can. I know I should seek psychotherapy, but I can’t. When you combine a phobia of mental health professionals with what is suspect is agorophobia,I quite simply can’t do it. Even if I could get there, which involves finding someone to take me and fighting against the agorophobia, I couldn’t talk to them. I have tried several times, and it seems like every time I go, I end up with another new diagnosis. Personally, I think I need to fix what we already know is wrong with me before we go searching for the rest of the issues. I am aware OCD (Obsessive Compulsive Disorder), PTSD (Post Traumatic Stress Disorder) and MDD (Major Depressive Disorder) cause a lot of other issues, or at least are usually found combined with several other issues. Someday I will figure it all out, I hope. Ok, so enough of the poor me routine. I tried to keep this all factual as far as my life goes, but it always comes out sounding like a poor me anyway. Sorry about that. Usually I just tell people I have severe arthritis, and nerve damage from a car accident. It describes my limitations in a way that people understand as a general rule. Too many people do not understand, or even try to understand fibro. Most people with this disease are able to live a normal life, or with slight modifications and medications. Some of the unfortunate few like me have a much more difficult time living with it. It took several years and several failures to find a medication that helps me at all. On a scale of 1 to 10, with 10 being the worst pain ever, my daily life was at a pain level of 6 or 7. My medications take that to a level of 3 to 5 on a normal day. Some days are worse, and a few rare days it is better. I am NEVER pain free. I am happy to answer any questions you might have about fibro, or anything else about my life. I do check LJ regularly for posts from my favorite fan fiction authors and will answer as best as I can. I am by no means an expert, but I think that by documenting my experiences as a person with this diesase in this forum, maybe I can get the word out, and help someone understand a little better about this disease and how it can affect a person’s life. Some of the disparaging comments I have heard (from my friends and closest family no less) include, there is nothing wrong me, or i am faking, or it’s all in your head. This is common for sufferers of fibro and it really doesn’t do us any good. As a final note, for the fanfiction authors, even if I don’t review, your stories are what keeps me going most days. Those days when the pain is so bad that all I can do is sit in my chair and try not to cry, I turn to fanfiction to keep me company and keep my mind off the pain. so Thank You, and keep up the good work. You are appreciated more than you know. This pic was taken in June of 2012, at my Grandma’s 85th birthday party/family reunion. This is me, with my daughter (21) standing behind me.